Dolls, to your left you will find Joie’s luscious Leo Cutout Lace-Up Flat Sandals; to your right allow your eyes to take in the perfection that is Steve Madden’s Paiigge. Though the Paiigge pretties are constructed entirely out of man-made materials, whereas the Joie’s are crafted out of true leather; for just $69.95, in comparison to the $255.00 price tag of their jazzy, high-fashion counterpart, they are le perfect way for the budget babe to add a bit of boho bliss to her shoe collection – at a price that leaves one with enough spare cash to splurge on all five fabulous shades (bone, black, cognac, mustard, or teal)! Thanks to Saks Fifth Avenue and Zappos for the pictures. Amazing! They are exactly the same! I wouldn't mind getting either of those. Those are so cute! I love either of them. more often than not, i choose to be thrifty. I love the Steve Madden ones. They're gorgeous. I would put on my thrifty cap and go for those. Wow, so much alike. I'd have to be thrifty, of course. Totally, the cheaper ones for me. I can't get over how much they look alike!! I love the details... a nice spin on the typical Gladiator shoe! They're exactly alike, I love this! These sandals are so cute! Great find, Erika! Wow the similarity between these two is just amazing! I'll take the Steve Maddens please! Perfect for spring/summer! Although I might be worried about odd tan lines, teehee. These are amazing from joie! These have a perfect boho chic to them! I love the Steve Madden ones. They're so pretty. I love Steve Madden shoes, so I have no problem saving my bucks to spend them in other things .... I need to start thinking about a bikini! I love them both but the manmade materials put off the second ones a little bit. I would probably splurge for the leather ones although I do love Madden shoes. They would look fab with a cute summer dress! Those are so cute for summer. I like how their a dressy sandal, I would even wear them to something fancier. I always seem to go for the budget version, I'm just a cheapskate at heart. OOOOH MY WORD! Want these! I might pop over to Steve Madden and try them on. i actually like the shade for the steve madden shoes much better - hope you are enjoying your weekend love! I would love them in mustard. So much springiness here! And I just realized you have a sidebar of all your topics. So smart! WOw they are identical! 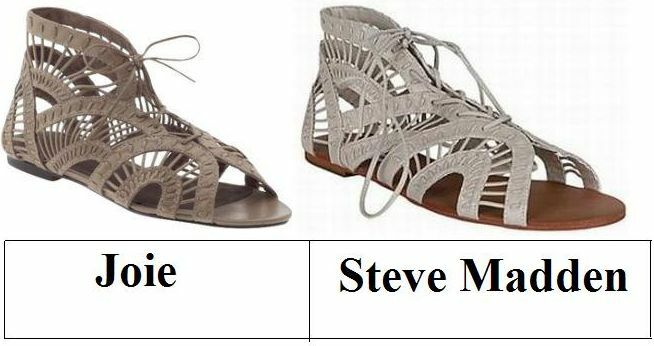 Steve Madden it is! These are so pretty, love both! cheap ones for sure, I love steve madden and don't feel the need to spend so much on flats! I wouldn't mind either! They seem the same to me... maybe the colour is different! I think I'd go all out on those! What a clever find, of course I would get the cheaper one. These are identical!! Love Steve Madden shoes and what a delicious find! Both pairs are adorable! And for the $70 price, Steve Madden gets my vote for sure! the steven madden pair are the best buy!